We flew into Ho Chi Minh City from San Francisco via Wuhan and Guangzho, China on China Southern. Tickets cost approximately $530 per person purchased five months before we left. China Southern is not an airline I would recommend flying, but I’ll get into that later. Ho Chi Minh City skyline from the rooftop bar. We got a taxi to our AirBnB from the airport. I recommend getting only Mai Linh or Vinasun taxis in Vietnam, though they still have their issues. Our AirBnB was in District 1, located in a narrow building above a scooter garage. We were running early for our meet-up time with Dana, our host, so we decided to wander around the neighborhood and into the backpacking district. Completely overwhelmed by the heat and jet lag we stopped into an air-conditioned cafe for ca phe sua da, or iced Vietnamese coffee with condensed milk. About an hour later we met up with Dana and she gave us a quick tour of the apartment, a clean and spacious studio with bathroom and washing machine. Centrally located and private, the forty-eight dollars a night was absolutely worth it. Best dumplings I've ever had in my life. We woke up to the sounds of Saigon traffic, a cacophony of horns and hawkers. We walked down the street and bought a couple of ca phe sua da to take to the park. The green spaces in Ho Chi Minh City are lovely meeting places where people like to hang out or work out, especially in the cooler morning and evening hours. Mi Quang from my cousin Jeff's favorite mi quang joint. My cousin Jeff picked us up on his motor scooter and deftly navigated us to his favorite mi Quang joint for breakfast. Mi Quang is a central Vietnam noodle dish flavored with turmeric and typically served with a light lukewarm broth. I ordered mine with pork and topped it with chopped scallion, another unknown green herb, and crushed up rice crackers. Al getting an unexpected massage at a backpacker bar. When evening came around, we met up with Jeff at a backpacker bar. After receiving an unexpected ear popping massage and numerous offers of weed from little old ladies, we enjoyed a few drinks with an international group of young backpackers, discussing the possibilities of a Trump presidency (this was in April of 2016, back when we thought such a thing was impossible). We continued our morning routine of grabbing a ca phe sua da and drinking it in the park. After checking out of our AirBnB, we hailed a taxi to my cousin Jeff’s apartment in District 3. Apparently, he had the wrong address (he’d just moved) and our taxi driver brought us to an empty lot with an oil tanker. Our taxi driver was incredibly nice and allowed us to use his cell phone as we were having a difficult time with using our phones. He insisted on staying with us until we were able to confirm that we knew where we were going. We grabbed a banh mi op la (banh mi with a fried egg) from the cart across the street from Jeff’s apartment and another iced coffee from downstairs. Such a simple and delicious breakfast. We dropped off our large backpacks and brought our day packs with us to the Mekong Delta. We managed to buy the correct tickets at the public bus station for Vinh Long, our jumping off point for our Mekong Delta adventure. The non-bloody part of our Vinh Long hotel room. We got stared at a lot, not in a mean way but in a curious way. There was one man on the bus who spoke limited English and he helped us communicate to the bus driver where we needed to be dropped off. Getting out of the city took hours longer than we expected and we arrived on the outskirts of Vinh Long as the sun was setting. We were dropped off on the side of the road next to a homestay where we were ushered into a dimly lit room. These were the worse accommodations that we stayed in on the whole trip (blood on the walls and sheets, a broken pane in the window, loud chanting at four thirty in the morning) and I would highly recommend booking your accommodations ahead of time on one of the Mekong islands. We walked the four kilometers into Vinh Long only to find that the boat tour wasn’t going to be until 11:30, even though our guidebook said it was best to get there at 8:00 am. We visited the Vinh Long Museum (don’t bother) and drank iced coffee in the shade while being mean mugged by a little person. A young woman making rice paper. Floating market on the Mekong Delta. Our bus ride back to Ho Chi Minh City was in a large, private van and a much smoother ride even though there was a very noisy basket of chickens sharing the vehicle with us. That evening our friends arrived from Croatia to continue our trip with us. They met up with us at Pho24, a soup chain with relatively decent pho. We spent the morning wandering around Ben Thanh Market before heading to the Ho Chi Minh airport. We took a domestic flight to Da Nang, a central Vietnamese city known for My Khe (China) beach. Our hostel in Da Nang was next to the river and was my favorite accommodation outside of our AirBnB in Ho Chi Minh City. We stayed at Memory Hostel for ten dollars a night. These were dorm accommodations with shared bathrooms, but the beds were clean and the comfortable. The hosts were incredibly kind and spoke excellent English. That evening we wandered around the neighborhood around our hostel and along the neon-lit riverfront. We ate a mediocre and rather expensive by Vietnam standards, dinner. In the morning our hosts took us out for a breakfast of Hu Tieu Nam Vang, a Cambodian and Chinese influenced pork noodle soup. They explained to us how to get the bus to Hoi An. Personal sized grill at a restaurant in Da Nang. That evening Al and I wandered along the waterfront and watched various coordinated dance groups boogie down to a variety of Vietnamese covers of American classics. We ate a dinner of grilled meats and hard boiled quail eggs. Trains are one of my favorite ways to travel and the train over the Hoi Van Pass was no disappointment. The train cost $21 total for all four of us in a sleeping berth. The berths were hard as a rock but it was nice to have a private cabin to ourselves. The train takes longer than you would expect for the distance, but the ride is beautiful. The view from our train over the Hoi Van Pass. We walked from the train station along the Perfume River to our hotel, Hotel Valentine. We shared a room for $12 per couple with a private bathroom. The room also included a choice of breakfast: bun bo hue, pancakes, or baguette with cheese and jam. That evening we ate a feast of Hue imperial cuisine, a tasting menu of tiny dishes. In the morning, Al and I explored the town after a simple breakfast of baguette with cheese and jam. Once our friends were up, we walked to the Imperial Palace, the main tourist attraction in Hue. Historically Hue was the capital of the country and the home of the Imperial Nguyen family. The palace is continually being restored and is a stunning, peaceful location despite the hordes of tourists. Next to the palace is the museum which is also worth checking out. After the museum and palace, we wandered around the disappointing Hue market and headed back to the air conditioning in our hotel room. The evening was spent eating a variety of fried street food along the Perfume River. We arranged an all-day tour to one of Southeast Asia’s largest cave systems, Phong Nha Ke Bang. We are picked up at our hotel and the drive takes around five hours to get to the cave. The tour includes a stop at a restaurant with some of the worst food we have on the whole trip. The cave is stunning and absolutely enormous, definitely one of the most amazing natural sites I’ve ever seen. On our way back from the cave, our bus started belching black smoke. Our driver got us down the mountain and pulled into a small town. Seven, our tour guide, disappeared for nearly three hours without a single word to the tour group. The bus driver and a couple of mechanics tried to weld parts of the bus back together, but after a second attempt to get us back to Hue, the bus began to smoke again. The group of us hung out in someone’s driveway in the scorching heat while our tour guide rustled up another bus. Nearly four hours later we were making our way back to Hue. In the morning we took a sleeper bus from Hue to Da Nang over the Hoi Van Pass. Sleeper buses are something I’m glad to see starting to appear in the United States as they are a wonderful concept. Cheaper than a train or a flight, but more comfortable than sitting the entire time, the sleeper bus is a great way to get around Vietnam. This bus ride took most of the day and so we just ended up checking into the Memory Hostel again and going to sleep early. We took an early flight from Danang to Da Lat where we were picked up by a taxi arranged by our hotel Happy Homestay. 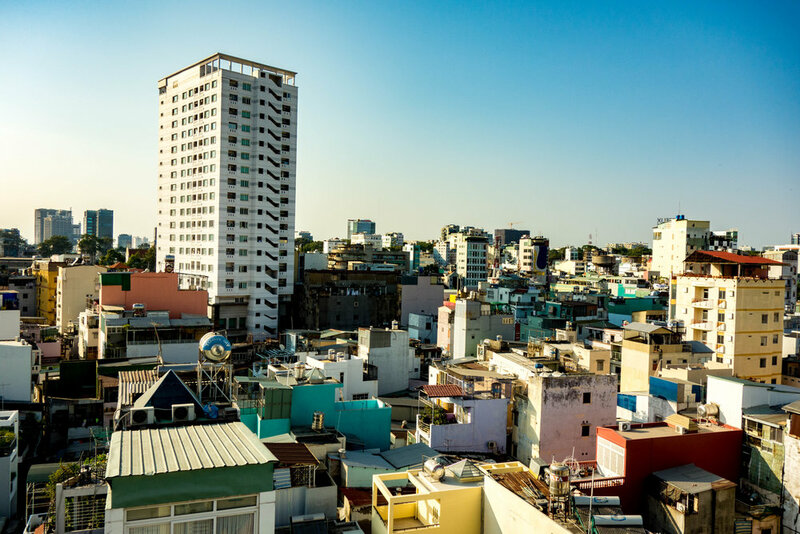 Regional flights in Vietnam are relatively cheap and the fastest way to travel from north to south. We flew on Vietnam Airlines while we were there but there are other cheaper airlines available (these had poor reviews for customer service and safety). Da Lat is a cool, quiet refuge from the rest of Vietnam. Located in the central highlands, the terrain looks more like the Santa Cruz mountains near San Francisco than the jungles one would expect. Da Lat itself was designed as a mountain retreat for French officers and its skyline was built to resemble Paris. Wandering around the Da Lat market which had mulberries, avocados, and strawberries; very similar to northern California! It was a jam-packed morning, so when we got back to the hotel we napped for a bit. Al and I then decided to head up on our own to Crazy House, a local tourist attraction built by the daughter of a former president. As one of the few people in the country allowed to build without following building codes, this house does not follow any building conventions. It definitely deserves the name Crazy House. Street vendor making Da Lat pizza. That evening Binh took us on a street food tour, no charge, of Da Lat. On this tour, we ate Da Lat pizza, bo la lot (grilled meats wrapped in betel leaves), papaya salad (gai du du), and ice cream. This was a great cultural exchange for us as we discussed the different ways in which our cultures used corn and avocado. Binh had a hard time believing that we would make corn into flatbread (tortillas) and use avocado in savory applications (he’d only had it in sweet). The food in Da Lat was some of the best in Vietnam because the produce was such high quality and very fresh. Another day another long bus ride to somewhere else. The bus ride from Da Lat to Ho Chi Minh City takes about eight hours which includes a stop for lunch and the bathroom. At least the buses are comfortable and have fast wi-fi! When we arrived back in Ho Chi Minh, we picked up our bags from Jeff’s apartment and checked into the same AirBnB we started the trip at. Jeff had to go back to work but promised to meet up with us for dinner. The rest of our afternoon was mostly spent sleeping and showering. Night life scene in Ho Chi Minh City near Ben Thanh Market. That evening Jeff met up with us and we grabbed a dinner of sushi. By this point, Al and I were beat and looking forward to the trip home the next day. One last morning in Vietnam. One last iced coffee with condensed milk to enjoy in the park. The finale of our trip was bittersweet: we were both homesick and exhausted but we also didn’t want to leave Vietnam. We had fallen in love with this beautiful and vibrant country that was so alien to us yet had familiar elements. We took a taxi to Ho Chi Minh Airport. I got the best Burger King chicken sandwich I’d ever had in my life and one of the most expensive meals that I had in Vietnam. The first leg of our flight on China Southern was from Ho Chi Minh to Guangzho. I did not eat the plane food but Al did and with terrible consequences. He spent the entirety of our eighteen hour layover in Guangzho throwing up in our stifling, cigarette-smoked infused business hotel room. If you’ve ever flown through Guangzho you know that it can be an intimidating venture especially for someone who does not speak Cantonese or Mandarin. There was lots of people in uniforms screaming at us and we had no idea what they were saying. There were endless dimly lit hallways with thousands of people packed into them and no one had any clue what was going on. Still queasy from the night before but no longer throwing up, the fourteen hour flight the next day was no walk in the park for Al. Eventually, we did make it back home in one piece just not particularly enthused to fly China Southern again.